Welcome to my Sixth interview segment, where a collector answers 13 short questions. The same questions will be given to every collector appearing in this segment. I’m really excited to welcome American Masters of the Universe Collector, Tom Ace onto the blog. 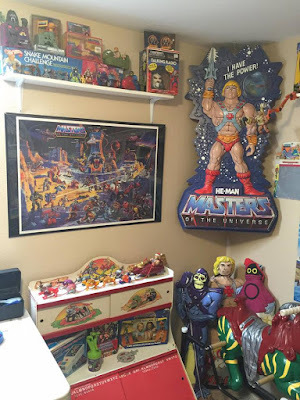 Tom: I was born in 1982, and Masters of the Universe toys were the first toys i remember playing with. I had a lot of the figures, some vehicles and of course Castle Grayskull and Snake Mountain. 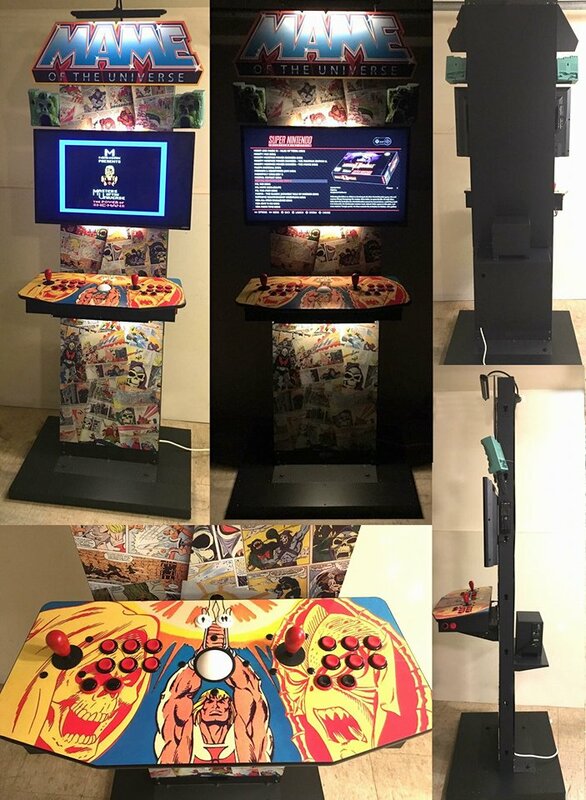 Currently I work in the IT field, and also have a graphics business making signs, decals, logos, wraps and many other things. 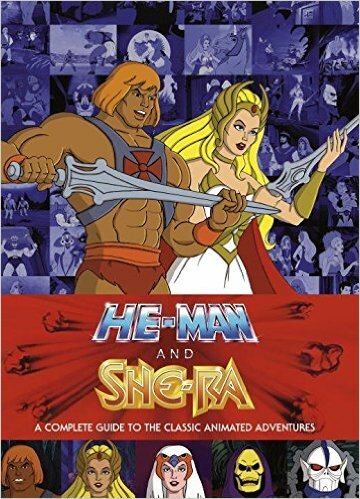 I have 3 kids and I'm proud to say that they are growing up appreciating MoTu and other fine 80's properties like Ninja Turtles, Ghostbusters and SheRa. They also have a fairly good 80's toy collection that they love playing with. 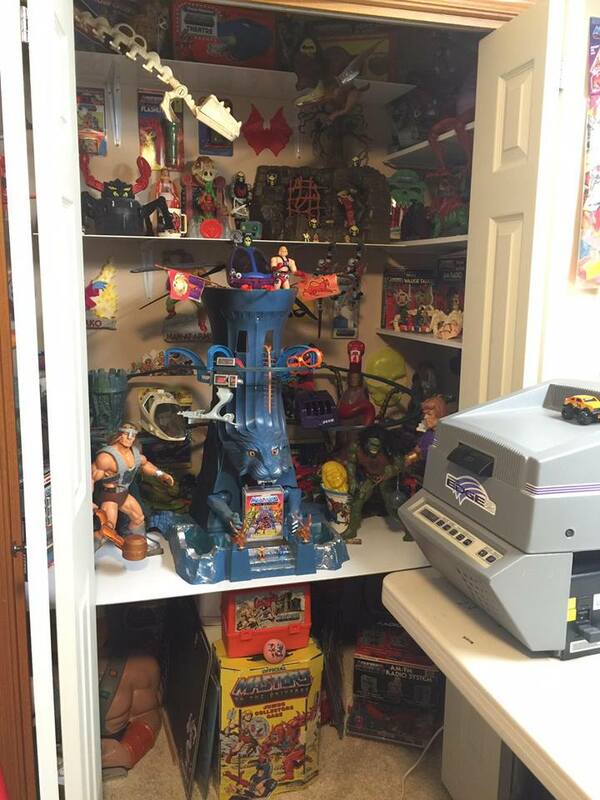 Tom: I was at my cousin's house several years ago and he was throwing away a few boxes of his old toys. 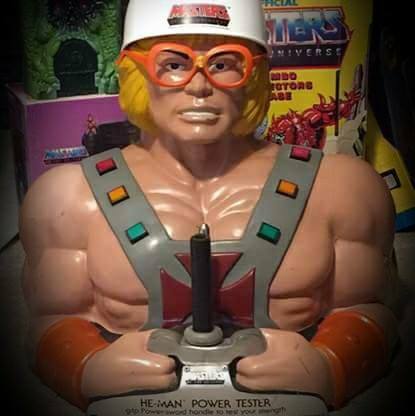 When I saw they were HeMan toys I instantly had a ton of memories come back to me and I told him I'd take them. 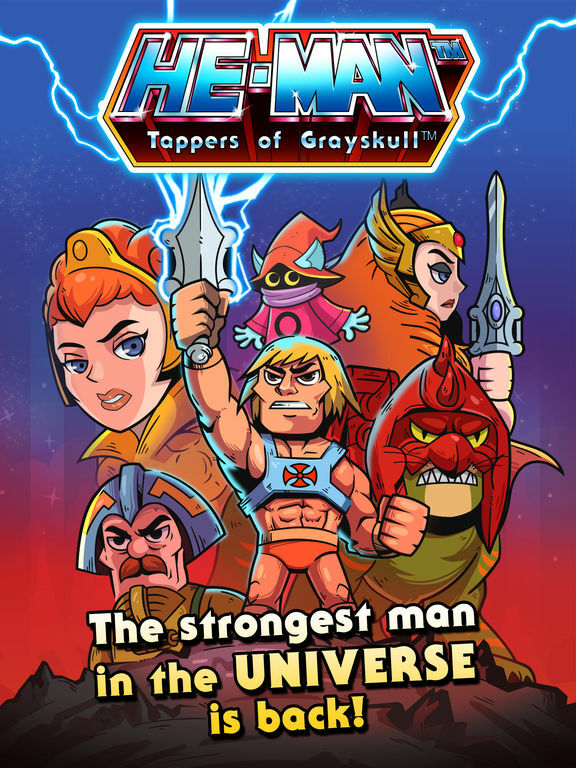 I got SyKlone, Grizzlor, Hordak, Buzz-Off, Mantenna and Stinkor. None were complete but I didn't care. It was just cool to see those things again! Tom: Once I stopped playing with my toys in the 80's and 90's they all got sold at yard sales, or donated to Goodwill. The only things I have from my childhood are my baseball cards. A little over 4 years ago was when I got those 6 incomplete figures from my cousin, and that started it all. I found their weapons to complete each one, then started buying the other figures I had as a kid. Once I had all the figures, vehicles and playsets, I started collecting all of the merchandise, and that's what I mainly look for today. 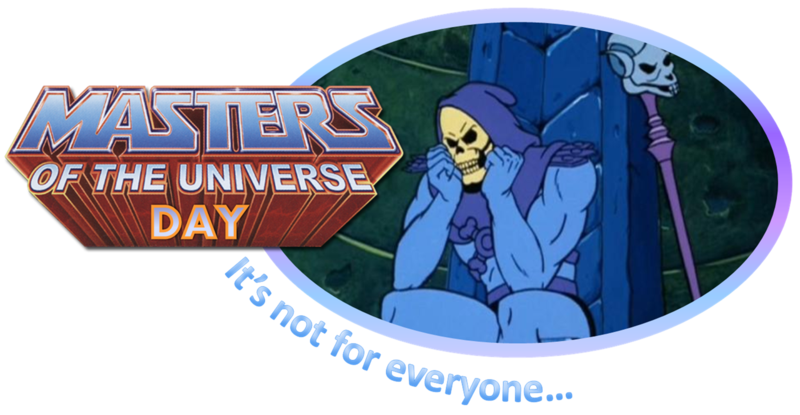 There were so many things made with the MoTu logo on them, that I doubt anyone could ever have every piece that was produced. I still see things that I didn't even know existed, so that keeps the collecting fun and exciting still. Tom: I mainly collect MoTu. 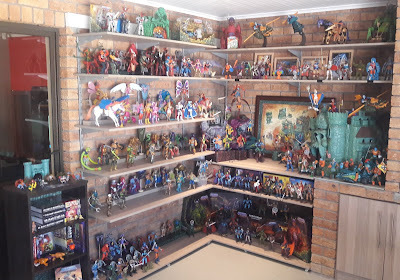 I used to have fairly large Transformers, Ninja Turtles, Ghostbusters and Star Wars collections, but decided that MoTu was always my first love, so I sold off all of that stuff and went all in with MoTu. 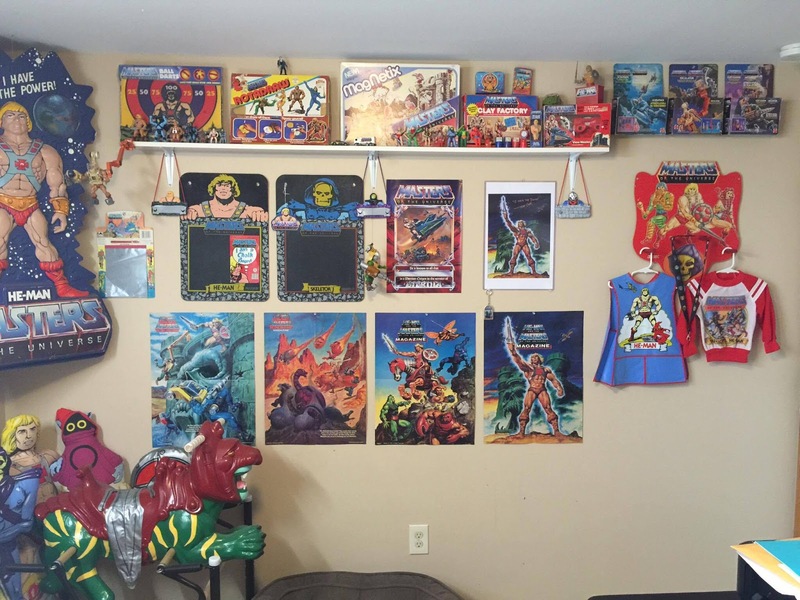 I love all the figures and toys, but the MoTu merchandise and odd ball pieces are what I love collecting the most. Tom: That's a tough question! I have a few favorites. HeMan Power Tester, HeMan Telephone (which I use daily at work!) Skeletor on Snake Mountain Toothbrush Holder, and both the of MoTu Big Wheel bikes. Tom: When I first started collecting and joined some Facebook groups, there was this guy who everyone talked about. 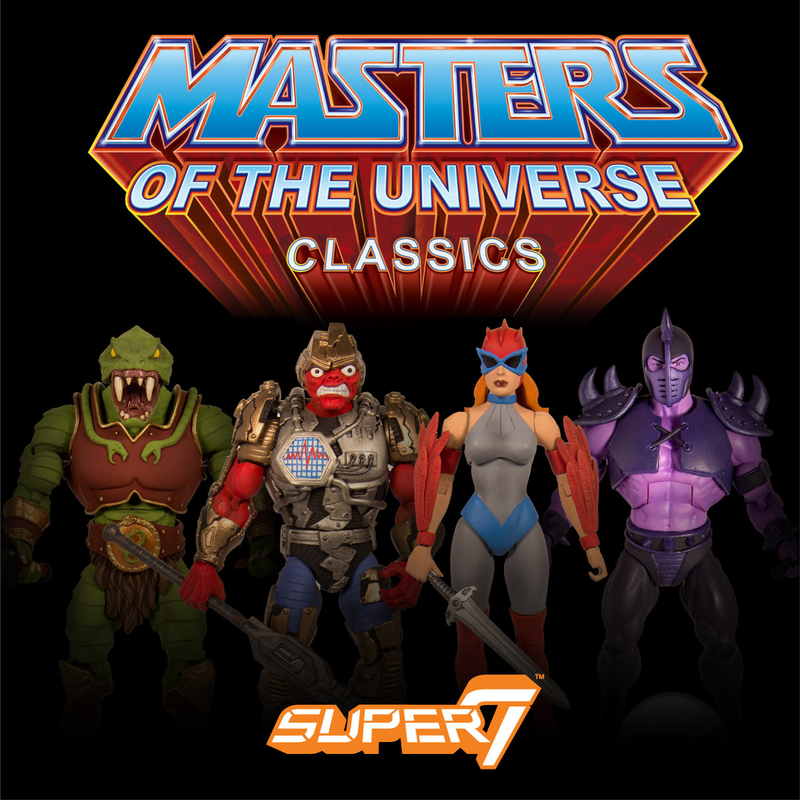 (Joe Amato) He was/is THE MoTu guy. So I started asking him a million questions about toys or merchandise pieces or anything else MoTu related that I hadn't heard of, or that I was looking for. It seemed like every time I found something unique I would send him a picture, and he would say that he had that piece, and he's had it since childhood. 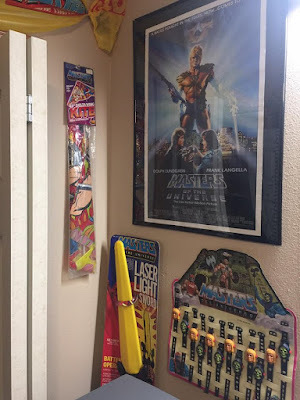 He has a giant collection, and almost all of it was from his childhood. That's pretty cool to hang on to that stuff all those years. There's several other collectors that have inspired me as well and helped me find some rare items. It's fun to see other people's collections because someone always has that one piece that you've been dying to get but haven't found yet. Keeps me motivated to stay on the hunt! Tom: When I first started collecting I found a bunch of vintage (so I thought) cardbacks and boxes. I had just got them all displayed and was feeling pretty good, until someone pointed out that they were all from the commemorative series. I didn't even know there was a commemorative series at that time, so I was totally disappointed. I didn't spend too much money on them though so that was a good thing. Tom: I'm an old school guy. I only like the original stuff. That's what I grew up with, and that's what I have memories of, so that is all I focus on. The New Adventures (which is totally digusting) and 200x have never piqued my interest. 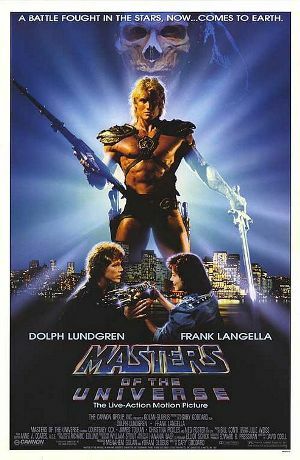 As for my favorite filmation epidsode... I would say it would be "The Dragon's Gift." I thought Granamyr was so cool as a kid and always wished they made a toy figure of him back then. Tom: I'm not sure what I'd change really. I think the collecting community is pretty good. Especially with all of the great Facebook groups. It's nice to meet other collectors and help eachother out whenever possible. Especially meeting people from other countries. 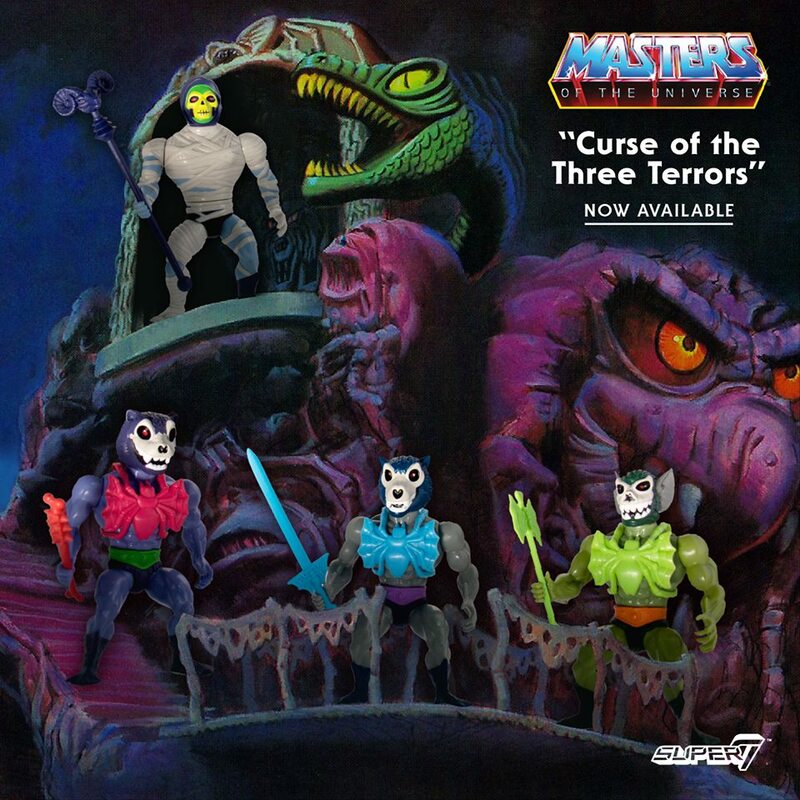 There is so much MoTu merchandise that other countries had that USA didn't, so it's nice to have contacts all over the world to help find items you never knew about. Tom: Facebook groups for sure. Forums are like going back in time. Facebook groups and messages are so much quicker and user friendly. It's nice to ask a question, or share a new item and have instant feedback. Tom: Ha, never thought about that... I guess I most resemble Blade because of the shaved head. Tom: Most of my Facebook friends know this I think, but I only collect loose items. It kills me to see toys stuck in their packages, or in a sealed acrylic case. If I do find something that is sealed, I open it as soon as I get it. I love seeing these old toys in action. Especially with the merchandise stuff. I love seeing the phonograph in action, or listening to HeMan rhyme about brushing teeth. I always keep the boxes in great shape, but I just can't leave anything sealed! Sometimes it decreases the value, but I don't collect for an investment. I collect because all of this stuff brings back great memories for me. As a kid I never imagined of keeping a toy in it's box, and I'm still like that today. Where's the fun in that?! Tom: I'm not too sure about that. I've never collected comics myself. I would think that for most people who collect a toyline, it's fun being able to read stories about their favorite figures in action. 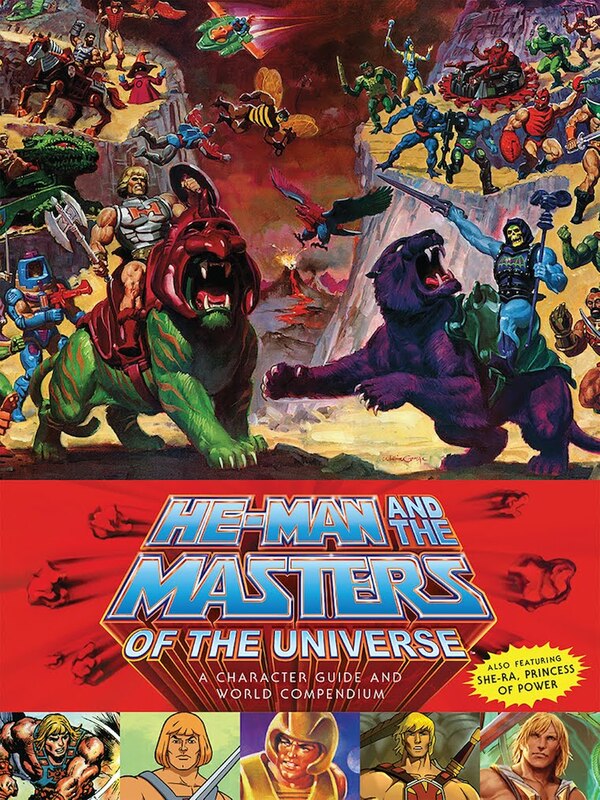 I have a few MoTu comics and story books that I read to my kids. It's fun seeing them re-create what we just read with their toys. If you really want to appreciate toys or comics or whatever, share them with kids. They don't care what things are worth or how rare something is, they just want to play with them as nature intended. Tom: What keeps me collecting is the thrill of the hunt. 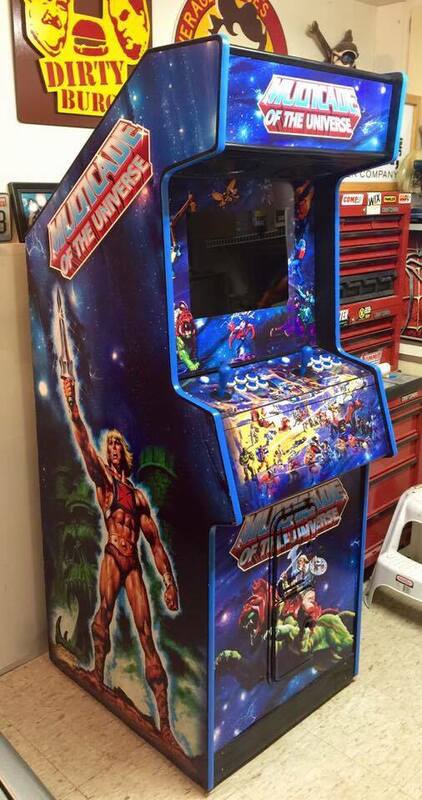 With MoTu merchandise, there is no end. I still see things that I never knew existed so that keeps it exciting. If I see an item online somewhere, or in someone's collection, and I don't have it, then I put that on my list and start searching. MOTU! : Well thank you so much for joining me today Tom. It has been an immense pleasure and I’m sure my readers will enjoy reading your answers as much as I have! Tom: Thank you very much for thinking of me to interview!